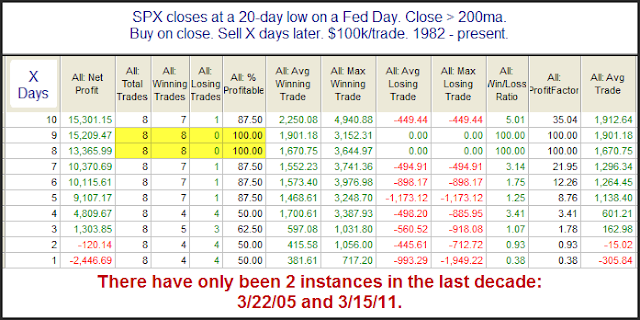 In last night’s letter I examined 20-day lows that occur on Fed Days during long-term uptrends. The results appeared interesting. You'll find the stats table below. Over the first 1-4 day period there doesn't appear to be much of an edge. But over the 5-10 day period the market has reliably risen. Instances are low, but I still thought the two-week results were strong enough to keep in mind and give some consideration. In the April 19, 2010 blog I showed a compelling study that examined large drops on Fridays. Both the Crash of ’29 and the Crash of ’87 happened on Monday. The Crash of ’87 is still remembered by many traders that are active today. There was a strong selloff on Friday and then all hell broke loose on Monday. But since then strong Friday selloffs have commonly been followed by bounces on Mondays. Perhaps this is due to the fact that fear of a crash causes what might otherwise be an ordinary selloff to become exaggerated and overdone on Fridays. Or perhaps it is just that people don’t want to hold over the weekend. Whatever the reason, the tendency to bounce has been very strong. I’ve updated that 4/19/10 study below. The numbers here are all very impressive and suggest a strong bullish bias. Opex week during October has typically been a strong week for the market. This can be seen in our op-ex week breakdown by month from March. And much of the upside edge has been thanks to the strong op-ex Monday returns. 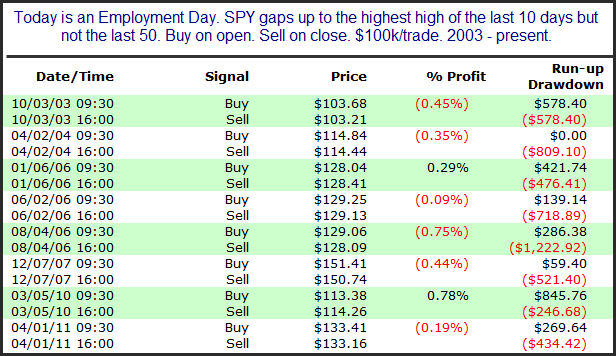 But op-ex Monday in 2008 was SO unusually strong (11.5% 1-day gain) that I decided to run the numbers excluding it. So here is a look at October op-ex Mondays since 1984 not including 2008. As you can see the numbers are still very favorable. There appears to be a bit of a bullish seasonal edge today. In an older study in the Subscriber Letter I looked at bounces after SPX is strongly short-term oversold as measured by RSI(2). What I found in that letter was that lower-volume instances on the first day of the bounce have performed much better over the next few days than higher-volume bounces. I won’t rehash the whole study here, but I will show performance following higher volume bounces like Thursday. As you can see, it appears that such bounces suggest a short-term downside edge. One reason the blog has been slow this week is that I am preparing for my trip to Atlanta next week to speak at the MTA meeting there. If you’re in the Atlanta area and would like more info on my talk you may check out the link below. You don’t need to be an MTA member to attend, but you should consider joining. While the stock market is open on Monday, banks, schools, government offices, and the bond market are closed. In past years with the bond market closed, the stock market has done quite well on Columbus Day. Of course the most famous Columbus Day rally was in 2008 when the market gained over 11% after having crashed the week before. 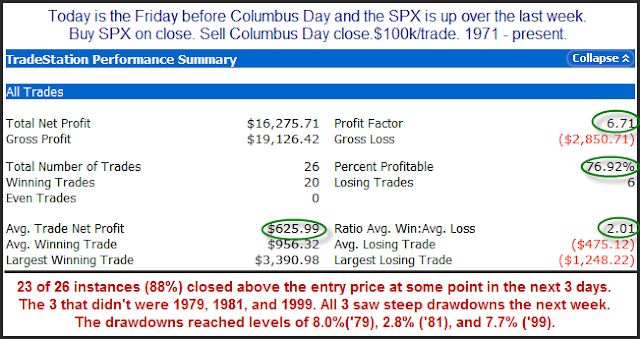 Last year in the 10/10/11 blog I showed that positive momentum leading up to Columbus Day has generally led to a positive Columbus Day. Columbus Day has been celebrated on the 2nd Monday of October since 1971. Below is an updated version of last year’s study. I’ve circled some of the more impressive stats here. With 77% of trades profitable and winners twice the size of losers risk/reward has been very favorable. I wouldn't get too excited about this with the low sample size, but early indications appear to suggest a mild hint of a downside edge between now and the close. Somewhat unusual about the rise in the SPX Monday was that it was accompanied by a rise in the VIX as well. Most of the time they mirror each other. One quirk with the VIX is that it has a tendency to fall on Fridays and rise on Mondays. Therefore this setup is more common on Mondays than any other day of the week. The table below examines performance on Tuesdays after this has occurred. I only show 1-day results here because anything longer shows no inclination. And while the edge here isn’t terribly strong, it is interesting that the VIX’s inclination to rise on Mondays does not seem to completely eliminate the tendency for the SPX to pull back the next day. Of course if this setup happens on a Friday, then the downside edge is more pronounced.